Machine Monitoring & OEE Software. 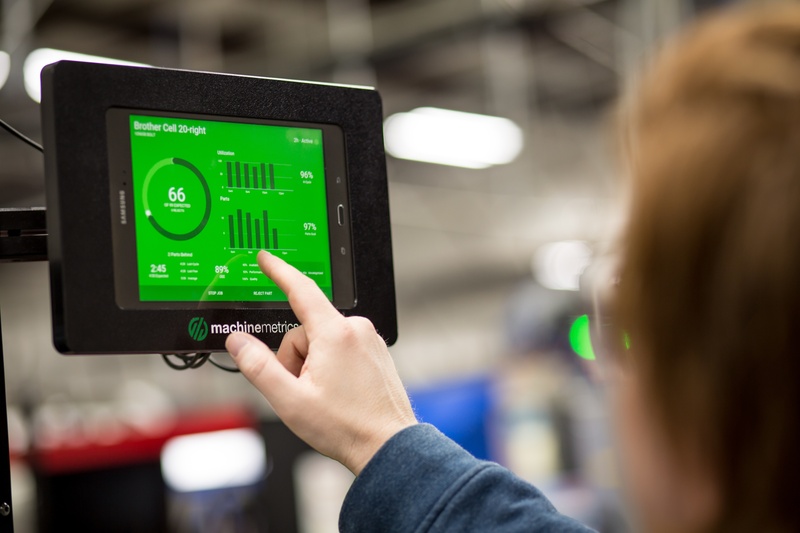 MachineMetrics has simplified IoT for the shop floor: our fully automated machine monitoring & OEE software provides visualizations of real-time manufacturing production data, instant notifications, as well as historical analytics, allowing factory workers to make faster, smarter, more confident decisions based on real-time data. MachineMetrics has identified huge gaps in current manufacturing processes: a lack of real-time production visibility and a lack of communication between machine operators and their managers. Previously, no machine monitoring solution truly solved this problem. We spoke with 100+ manufacturers to gather their feedback on why their previous machine monitoring solutions did not fit their needs and how it could be designed better. Featuring simple “self-install” IIoT connectivity, MachineMetrics cloud-based machine monitoring and OEE software gives your team the ability to track real-time OEE, quickly identify production bottlenecks, and measure the effects of process improvements. The Results speak for themselves: we’re driving manufacturing efficiency by more than 20% on average for customers. 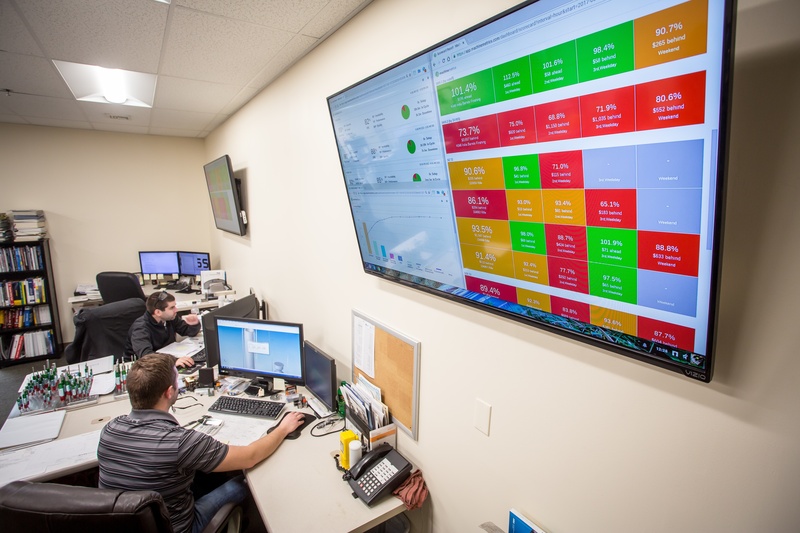 For manufacturers, installing web-enabled shop-wide machine monitoring systems is that first and most important step to harness, structure, and take action on production data. 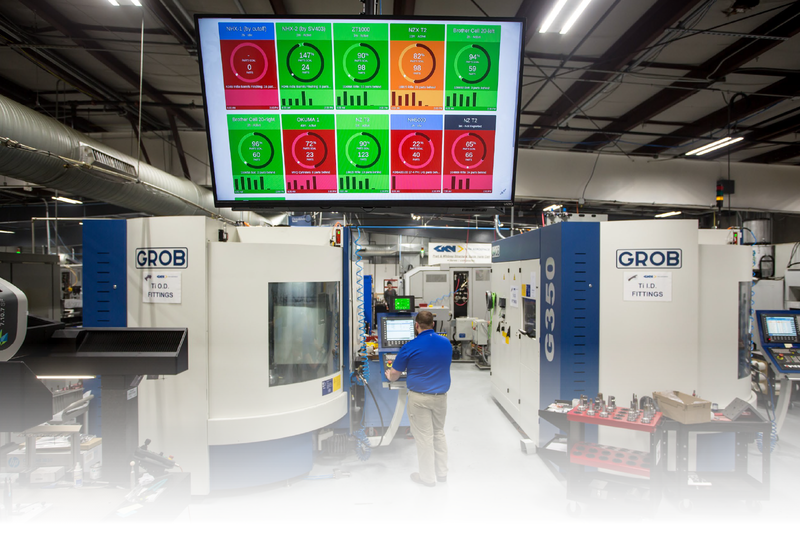 Using MachineMetrics, manufacturers can finally bring smart manufacturing to the factory floor with software that’s simple to integrate, easy to use, and produces powerful results. MachineMetrics user-friendly platform easily integrates with any machine type including Precision CNC, SWISS, Stamping, and Die or Mold. 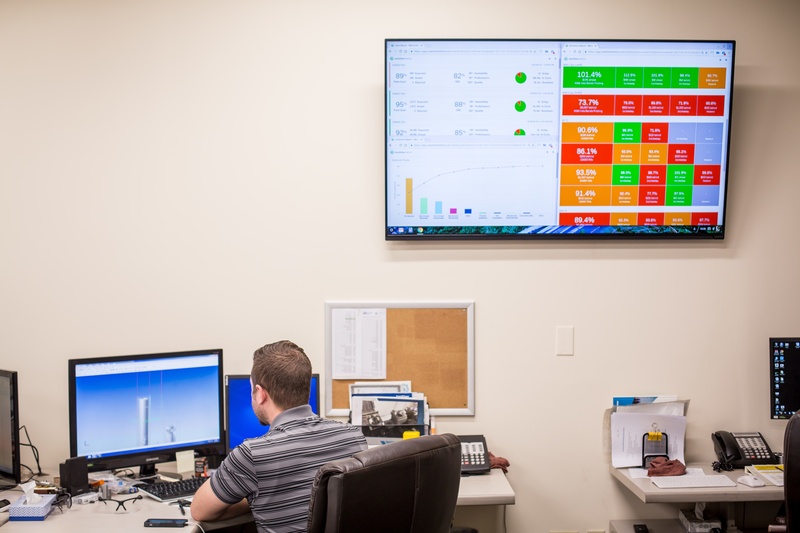 MachineMetrics machine monitoring software is a perfect fit for manufacturers who are looking to enhance shop floor communication, improve OEE, and embrace data-driven smart manufacturing. Collect data from each machine control and machine operator for the entire production floor. Touch screen tablets at each machine guide operators through jobs and allow for additional human context to machine data. Secure all performance data via onsite IoT Gateway that protects your machine network from the public internet. All machine data is encrypted and stored in the cloud before being securely relayed to your shop floor, desktop or mobile dashboards. Access this data from anywhere at any time using MachineMetrics’ mobile friendly, secure cloud application. 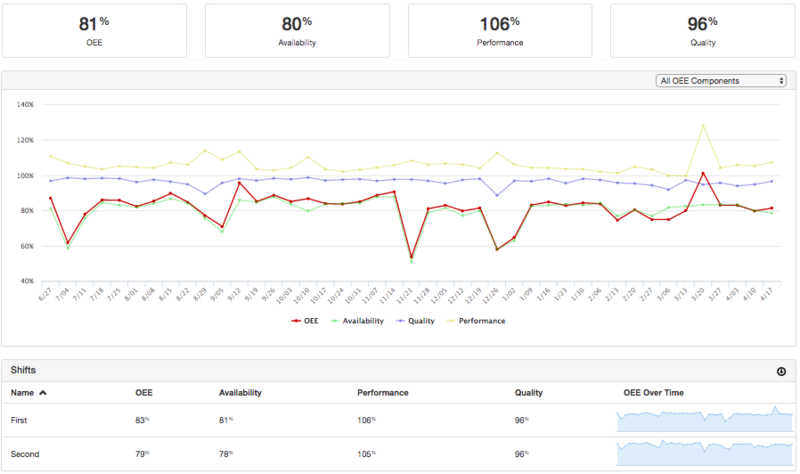 Visualize data using real-time dashboards on the production floor that provide an at-a-glance indication if jobs are performing at or below expectations (against Parts Goal or OEE metrics). Monitor machine conditions (faults, status, tool utilization), production (OEE & Machine Utilization), work-order status, quality tracking and downtime reasons that can be auto classified or indicated by the operator with touch screen tablet interfaces mounted at the machine tool. Analyze using robust and superior reporting features including OEE reports, job reports, downtime and quality Pareto reports that compare data by shift, machine, and individual job/parts. Enhance your team’s ability to improve efficiency, quickly identify production bottlenecks, and measure the effect of process improvements. Empower your manufacturing operation’s digital transformation with MachineMetrics machine monitoring and OEE software. Knowing why machines are not running is key to understanding machine downtime and utilization problems. 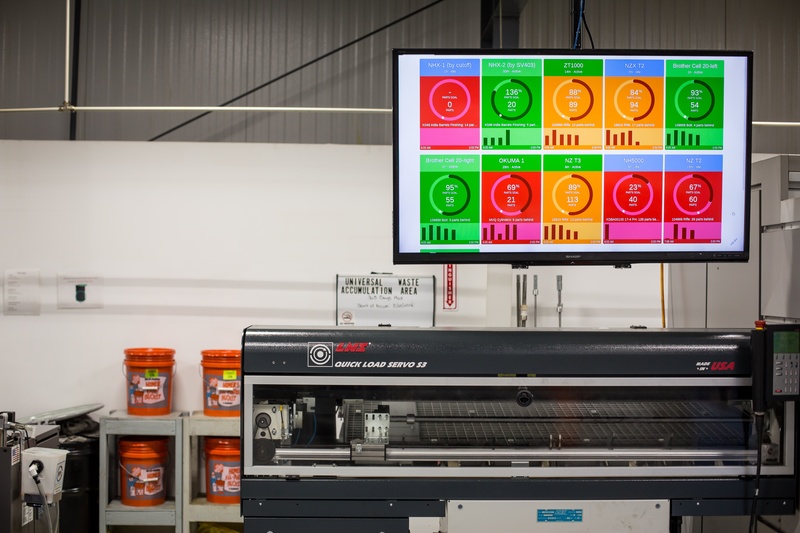 Having a touchscreen at each machine with an intuitive interface that asks the operator to categorize downtime as it's happening allows this information to be made available in real-time to managers in downtime pareto charts. For some events such as tool changeovers or part changeovers, these machine downtimes can be categorized automatically from machine data by the MachineMetrics rules engine. Real-Time Dashboards give factory workers the information they need to make decisions that drive improvements. Simple color-coding provides an at-a-glance indication if the job is performing at or below expectations (against Parts Goal or OEE metrics) and is measured in real-time. The shop floor dashboard is often installed on monitors across the shop floor at each cell. Our touchscreen interface allows for operators to add human-context to machine data with touch screen tablet interfaces mounted right at the machine tool. A “Google Maps for Operators”, the Operator View allows operators to categorize downtime, reject a part, and start/stop jobs right from the machine to manage and record quality data. For any job that falls behind or machine that goes down, a text or email notification can be sent giving managers who aren't on the shop floor the information they need to take immediate action. Alerts and notifications are entirely customizable, allowing you to notify the right person at the right time when an issue arises. 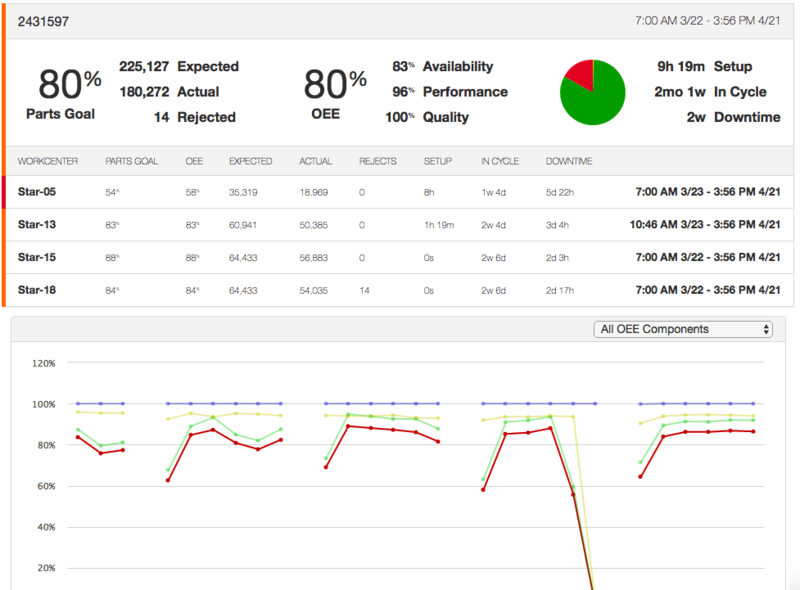 MachineMetrics is a robust OEE solution that automates the reporting of OEE by using machine's scheduled availability, performance of meeting ideal cycle times, and quality. Real-time OEE is available in various reports including the real-time dashboard, historical reports that can be compared by shift, and when viewing individual job/part reports. OEE information is presented in eminently understandable form, allowing managers to quickly identify issues that are related to a specific machining operation and help measure the effect of process improvements. Operator can reject a part using the operator view. Quality managers are able to view the quality pareto in real-time and when there are new rejects, head to the machine in question, re-inspect the parts and re-allocate as necessary. All quality data can be tracked in MachineMetrics, eliminating the need for paper. 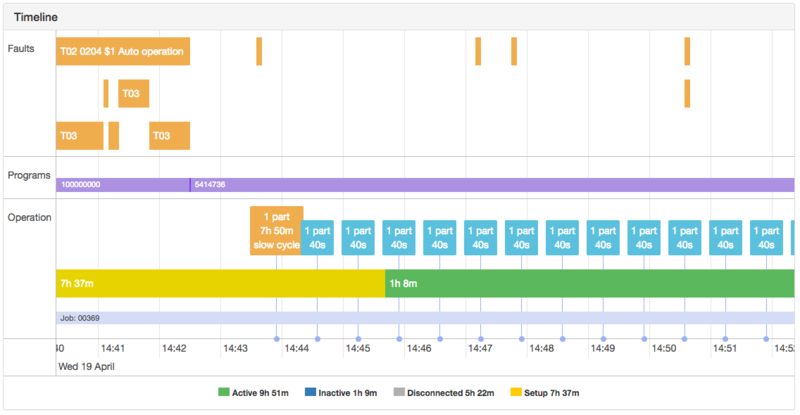 Manage and view real-time status of your machines across multiple departments and locations. Monitor machine utilization over time, and compare your company's data against industry benchmarks. Evaluate utilization trends over time. Justify the purchase of new machines by understanding excess capacity. Shops will often changeover jobs frequently, and this can be the biggest source of lost production time for a business. Setup times for the same job can vary wildly by operator, or by shift. Only by tracking setup time can this be improved. MachineMetrics will track setup time by incorporating it into the workflow when dispatching jobs. 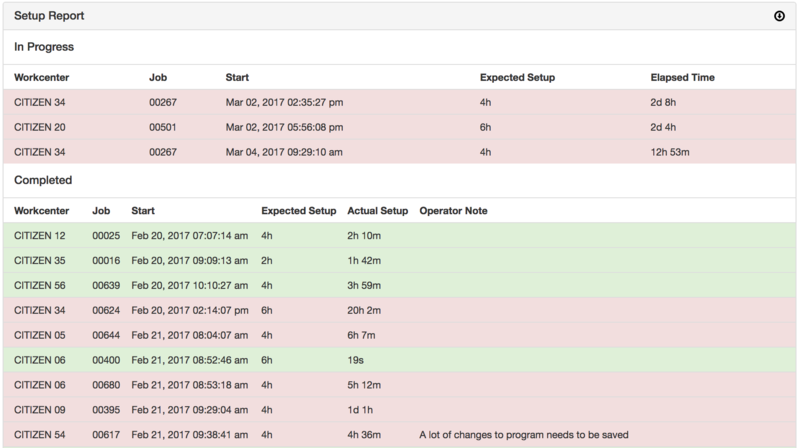 After a job enters setup, the Operator View counts up to the expected setup time. All time beyond the expected setup time will be considered unplanned setup, and be visible in the downtime Pareto chart. Setup times for all Workenters are available for reporting, and that data can be exported to CSV for further analysis. MachineMetrics is a historian for all of your machine data - with the ability to export all of the machine's event history for any period of time. The timeline is useful for analyzing what happened and when on your machine. Information such as status, faults, programs, part cycles, and the job is displayed on the machine timeline. View the status over time of all your machines for a single day, or drill down into a single machine for a very detailed view. The cycles report provides statistical analysis on part cycles - often uncovering part cycle times that were potentially underestimated. 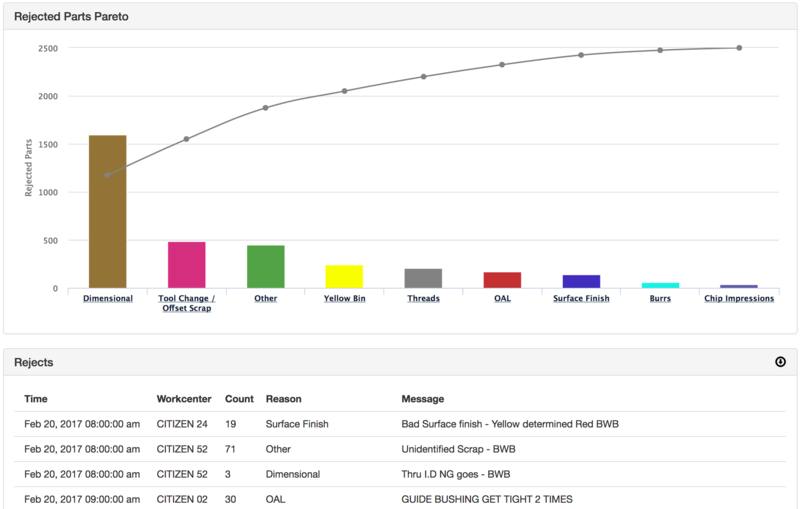 MachineMetrics provides detailed reporting and analytics of your machining operations. Information such as cycle times, performance, number of parts produced, rejects, downtime reasons, and reject reasons can be reported on for each part operation. This information allows managers to quickly identify issues that are related to a specific machining operation and help measure the effect of process improvements. Multi-pallet machines are supported as MachineMetrics uses the program name to determine what operation and part number is being machined, eliminating the need for operator input. 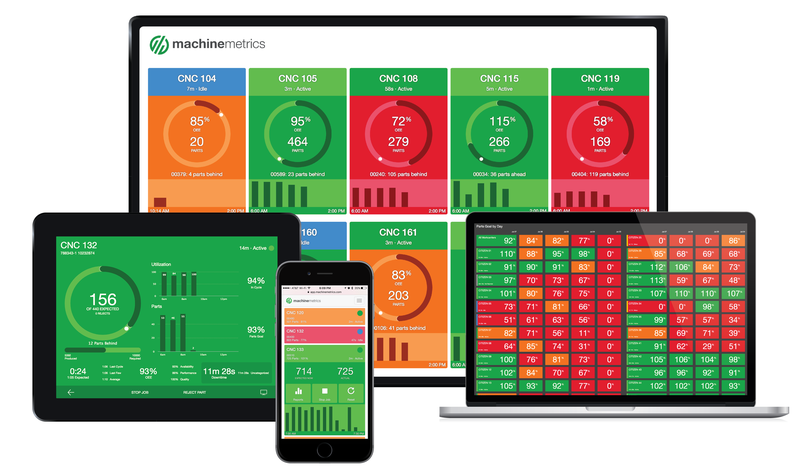 With MachineMetrics, you can start collecting data in minutes from networked machines that have MTConnect or OPC UA and from CNC Machine controls such as FANUC based controls with FOCAS (32i, 31i, 18i-C, 18i-D, and 0i-D), Mitsubishi M70, Marubeni Citizen-Cincom M700, Heidenhain 530, Heidenhain 640, and Siemens Sinumerik 840D sl. Other machines such as HAAS machines, Stamping Machines, and older equipment might require an inexpensive PLC that our field integrator can install during an on-site visit. MachineMetrics provides all customers with a customer success manager (CSM) whom, through routine meetings, helps train your team on our software and helps you meet performance goals. Customers often make feature suggestions, and CSMs are dedicated to making those requests a reality. CSMs are there to not only ensure success using MachineMetrics, but to know the right questions to ask and to make sure that customers are happy with their product experience. 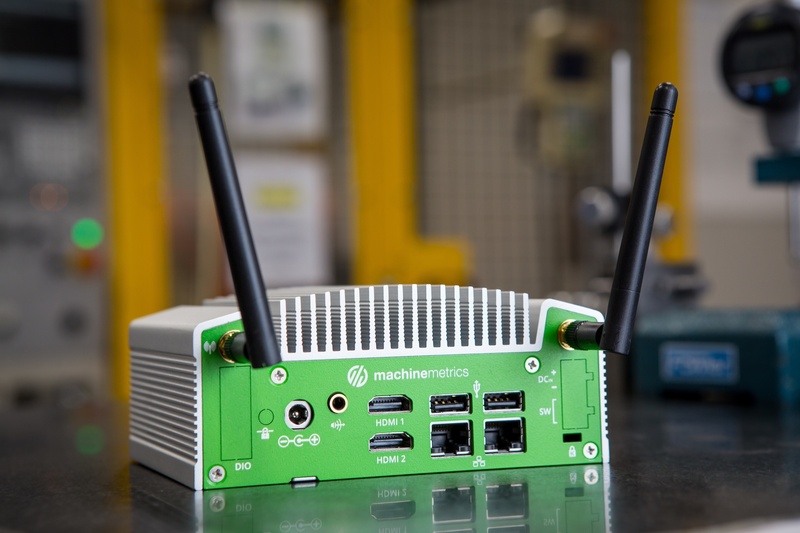 At MachineMetrics our focus is to bring Industrial IOT to the factory floor with a simple to integrate and easy to use OEE software system that helps companies who want to grow. Contact us at 1.413.341.5747 or email us and we will get back to you right away.